December 2018 — They’re called “Tropical Jewels” and for good reason. Diamantina® Dipladenia and Mandevilla genetics from Ball Ingenuity (formerly sold under the Summer Romance umbrella) are tropical bloomers with exceptional performance during hot weather. 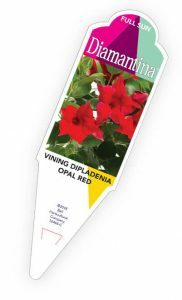 Original Mandevilla genetics come from the Diamantina region of Brazil, known for diamond mining. French breeders are behind the outstanding Jade, Opal, Tourmaline, and Agate series of plants, and the 2019 re-branding marks a return to the plants’ roots, so to speak. The three new varieties are available in limited trial quantities. 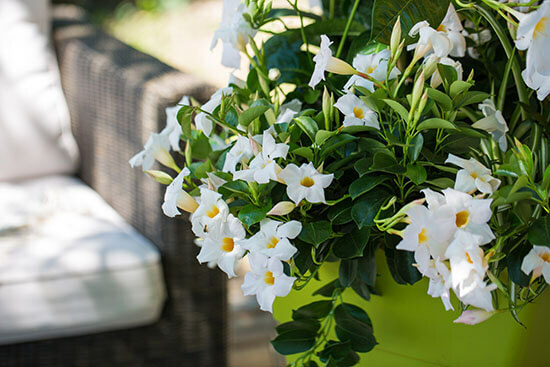 Both bush and vining types from the Diamantina® series bloom earlier than other Mandevilla/Dipladenia varieties and keep going when the mercury climbs – but the real reason why home gardeners flip for these plants is the color. Pepto pink Mandevillas might be a dime a dozen but only Diamantina® offers a true vining yellow-flowering variety (Opal Yellow). It is amazing on its own and show-stopping when planted with deep burgundy Opal Merlot. In 2020 the line is set to expand with orange-coral bicolor choices in both bush (Jade Series) and vining (Opal series) and a deep fuchsia bush type to complement the pale pink Tourmaline Bush Pink that’s available now. 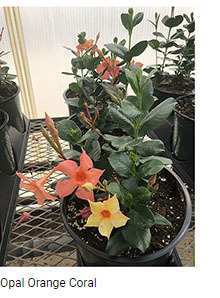 Orange is a new frontier for these genetics, and Diamantina® is the only range set to offer sunrise-colored Dipladena/Mandevilla flowers on the horizon. These make perfect patio plants and are excellent as container garden thrillers, no trellis needed. Exemplary branching habit and can be finished as quarts or larger pots. 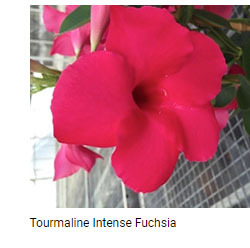 Tourmalines infuse love and compassion into their surroundings and consumers love this non-vining Mandevilla with enormous blooms. 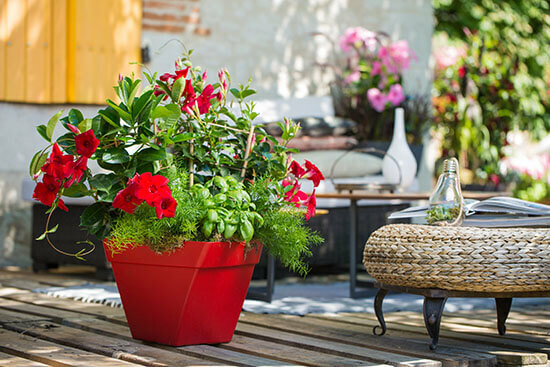 Grow in sizes ranging from 6-inch containers to solo large pots or mixed containers. Boasting two of the most unique colors, including yellow and merlot, the Opal Series has a controlled vining habit that allows it to be enjoyed outdoors everywhere. From mixed containers to hanging baskets and landscape uses, the flashy colors of Opal Diamantina® plants are certain to be sought-after. This is the bedrock of the Mandevilla offerings, offering the same vigorous Mandevilla habit that gardeners have come to enjoy, but with improved disease resistance and an earlier flowering time. Botany Lane Greenhouse grows specialty annuals, perennials, succulents and tropicals, finished and young plants, in 827,640 square feet of environmentally controlled production, one acre of shade houses, and 10 acres of field production at three locations across two states. They ship young plant material to all 50 states and Puerto Rico. In partnering with their customers, they strive to provide excellence in customer service and innovative products, thus ensuring the sustainable growth of the industry, customers and their business. 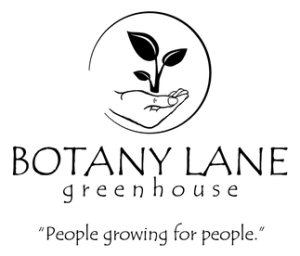 It is with their integrity of work, respect for customers, and value of the plants they grow that Botany Lane thrives. Ball Ingenuity is a division of Ball Horticultural Company focused on the development and support of new plant programs into North America through partnerships with plant breeders. Focused on a diverse group of products, the assortment is available exclusively through the horticulture distributor Ball Seed. Visit www.ballingenuity.com for more information. UpShoot, LLC is a boutique horticulture marketing firm specializing in the sales, licensing and marketing of new plant introductions to North America, Canada, Europe and Australia. 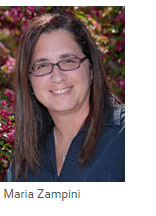 UpShoot also provides marketing services for gardening related products to both the trade and consumer audiences. For more information, contact Maria Zampini, President at 440-812-3249 or maria@upshoothort.com.